Dyson Zorb Carpet Cleaning Powder ..
Genuine Dyson DC40, DC41, DC55 and DC75 vacuum cleaner combination tool assembly. ..
Genuine Dyson tangle free turbine tool for select models of Dyson vacuum cleaners. .. This stair tool is a genuine spare part for select models of Dyson vacuum cleaners ..
Air driven brush bar mini turbine tool that removes pet hair and dirt from tight spaces like upholst..
Tool bag storer for easy retrieval. Roll bag contains pocket.. 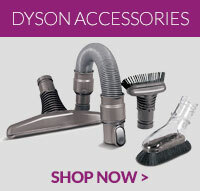 Complete Dyson allergy cleaning kit for cleaning dust and dirt from hard to reach areas. Speciali..
Genuine part for select models of Dyson vacuum cleaners ..